If you have never read a Temeraire novel, please don’t start with this one. It is the ninth (and supposedly final) book of the series, and I doubt it would make an awful lot of sense to someone who hasn’t read the rest (or at least some of the rest) – for best enjoyment of character interactions, all of them is good. 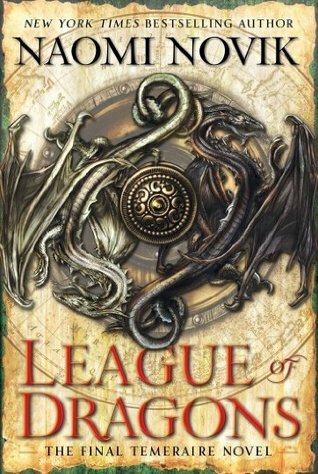 At the beginning of League of Dragons, the French emperor Napoleon has been recently routed from his invasion of eastern Europe, thwarted in the main part due to Temeraire and his captain, Laurence (in Blood of Tyrants – this book picks up immediately after the end of book 8). Of course, being Napoleon, that doesn’t really slow him down, and he is regrouping and making new plans even as his army is retreating across a frozen Russia, and Laurence and Temeraire find themselves once more caught up in situations they would rather not be part of, both in defence of Britain and in Temeraire’s quest to protect his egg. Temeraire’s guilt over the repercussions of past actions, and Laurence’s constant concern for his dragon, his crew, and his responsibility and honour, drive much of the story at hand, along with the continuing campaign and efforts to contain Napoleon’s desire for power. I read all eight of the previous books in the course of just a few weeks a little over a year ago, and I have to admit it took me a little while to get back into the world Novik has built. The early chapters are fairly slow and dialogue-heavy, but with political intrigue (compounded by dragonkind asserting their rights in new and untried ways) at the forefront, warmongering and subterfuge, the action in the second half of the book ramps up, and races to the very satisfying ending. If I have one real complaint about this book (and, to be fair, it’s a bit of an issue in most of the novels), it is that there is very little distinctiveness of “voice” for the characters. In the case of the British dragons and their humans, this can be somewhat explained by the way the creatures basically imprint on their riders; however, even between the human characters, and the dragons of other nations, there is very little to identify quirks of character, background or nationality, and this could get a bit confusing at times. That said, the variety of characters is quite diverse, and the worldbuilding is fabulous. I’m not the most knowledgable of historians, so I have only the vaguest idea of how much of Napoleon’s rise and fall is based on authentic elements (although I’m pretty sure there were no dragons involved in the real version…). My lack of education in the field means I wasn’t invested in the truth of the matter, but I think Novik has done a good job twining the fact and fiction and even someone who is au fait with the period should enjoy the way she builds her dragons into the story. If this is the last Temeraire book we ever get, I can walk away satisfied. If Novik decides at some point to continue the adventures of Laurence and his erudite dragon, I’ll be hitting the order button just as hard as I did for this one. Start at the beginning, and journey the world with Temeraire – it’s a fantastic ride.